On the slope of a hill in northern Italy’s Po Basin stands Casa Girasole. Built in the early 1930s by the Italian architects Angelo Invernizzi and Ettore Fagiuoli, this villa exemplifies the Italian style Futurismo in architecture. But what makes Casa Girasole truly extraordinary is its ability to follow the sun across the sky, rotated using an electric motor and providing its occupants with a panoramic view of the surrounding landscape. 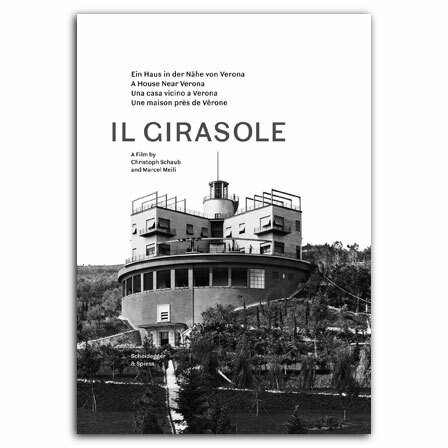 The award-winning documentary film Il Girasole offers an inside look into Casa Girasole, guiding audiences across the grounds and through the rooms of the villa, which has been entirely preserved in its original state. Filmmaker Christoph Schaub and architect Marcel Meili provide not just a history of this architectural feat but also a survey of its various rooms, furnishings, and decorations. The film also offers insights into the period in which the villa was conceived and constructed. The DVD is complemented by a booklet with introductory essays and illustrations and will appeal to anyone interested in twentieth-century architecture. (1953-2019), studied architecture at the Swiss Federal Institute of Technology Zurich (1973–1980). In 1987, he formed an office in Zurich together with Markus Peter. He was teaching as a professor at the Faculty of Architecture of the Swiss Federal Institute of Technology in Zurich since 1999.
, born 1958 in Zurich, is one of Switzerland’s most eminent film directors. Besides of documentaries on various subjects he has also realized many drama and comedy movies.